Seattle's controversial new "Amazon tax" was repealed Tuesday, a mere month after the City Council passed it unanimously. It was killed in response to public pressure from No Tax on Jobs, a business-backed referendum campaign. The campaign has already collected more than twice the number of signatures required to let voters decide on the November ballot whether to reject the tax, according to Tim Ceis, a general consultant to the campaign. 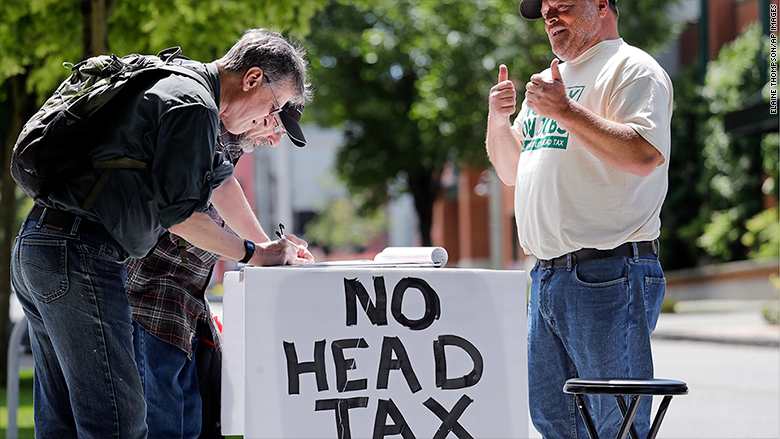 Several City Council members who had supported the so-called head tax nevertheless voted to repeal it because, as one said, "We don't have the time or resources to change enough minds to be successful at the polls in November." Progressives portrayed the repeal as a "capitulation" to big business interests. Amazon, Starbucks and the Northwest Grocery Association are among the biggest backers of the campaign. Related: Will these California cities impose a 'Google tax' or an 'Apple tax'? The tax, which had been scheduled to take effect in January 2019, amounted to $275 a year per full-time employee of the highest grossing businesses in Seattle. It would have raised roughly $47 million a year on average and expired after five years. There is as yet no replacement proposal on the table for how to fund the building of more permanent housing that the city needs. During the council's special public meeting, the actual vote to repeal was nearly drowned out by loud chants of "We are ready to fight. Housing is a human right!" and "Stop the repeal!" by groups who fought for the head tax for months. Organizers of the referendum campaign argue that the city already spends a lot of money on homelessness with few positive results. Their preference is for Seattle to join with other cities in King County, Washington, to combat the problem and to reform the existing system of how services are provided, Ceis said. In the wake of Seattle's original passage of its head tax, a number of cities in Silicon Valley have been contemplating head taxes of their own to combat traffic congestion and other transportation problems that have arisen as the tech sector dominating the area has grown. It's not immediately clear if the sudden repeal will dampen those efforts.